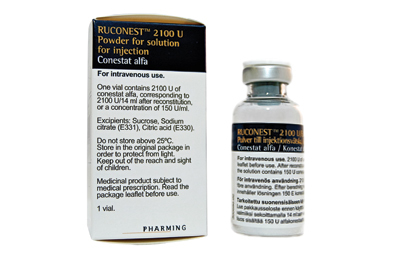 Ruconest (conestat alfa) is a C1-esterase inhibitor analogue and is licensed for the treatment of acute attacks of hereditary angioedema type I or II. Conestat alfa is a recombinant human complement component 1 (C1) esterase inhibitor obtained from rabbits. In 2 double-blind studies, 70 patients with hereditary angioedema due to C1-esterase inhibitor deficiency were randomised to receive conestat alfa 100 units/kg, 50 units/kg or placebo at the onset of an attack. In the pooled analysis, median time to beginning of symptom relief was significantly reduced in both treatment arms compared with placebo (66 minutes and 122 minutes vs 495 minutes, p<0.001 and p=0.013, respectively). Additionally, the median time to minimal symptoms was also significantly shorter in those receiving either 100 units/kg or 50 units/kg of conestat alfa compared with placebo (266 minutes and 247 minutes vs 1210 minutes, p<0.001 and p=0.001, respectively).